By understanding the link between speech sounds in spoken words and alphabet letters and letter combinations in written words, children learn to read and spell. The goal of phonics instruction is to help children learn and use the alphabetic principle - the understanding that there are systematic and predictable relationships between written letters and spoken sounds. Knowing these relationships will help children recognize familiar words accurately and automatically, and decode new words. By the age of six, most children already have about 6,000 words in their listening and speaking vocabularies. With phonics they learn to read and write these and more words at a faster rate than they would without phonics. Go to Reading Rockets and learn more about letter-sounds & phonics! Learning how to read in English is like cracking a secret code. Students must learn which letters or letter combinations stand for the 40 or so sounds of spoken English. Once they understand the code, students are able to use their knowledge to read and spell new words. Teaching the connection between letters and the sounds they represent is an important part of early literacy instruction. Phonics refers to instruction in letter-sound associations. 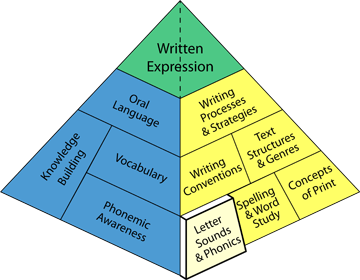 It is helpful to teach phonics explicitly and systematically. Begin with a set of letters, such as s, a, t, p, that can be combined to create two or three letter words so that students can immediately start reading and spelling words. Have students practice reading using books that contain familiar letter-sounds and words that can be easily sounded out. Teachers can informally assess students’ knowledge of letter names and sounds. They can observe students’ ability to use letter-sound knowledge to sound out words when reading and represent sounds in words when spelling. It is very helpful to look at young students’ inventive spelling because it provides a window into students’ understanding of the relations between letters and sounds.